Obverse: Bust of King Coenwulf facing right, with a diadem in his hair, finely drawn with four horizontal lines on the shoulders, the drapery devolved from a Roman prototype, dividing obverse legend. Text around, starting at 12 o’clock +COENVVLF REX M (‘Coenwulf King of the Mercian’s). Reverse: Rosette developed from a cross over a cross moline, no inner circles, initial cross of four wedges with centre pellet. Text around +DE VICO LVNDONIAE (‘From the wic of London’). History: This highly significant coin, the first new Anglo-Saxon gold penny to come to light for one hundred years, is a remarkable addition to the very select group of seven gold coins (the others now in museum collections). Unique as the only gold coin in the name of Coenwulf of Mercia (796-821). 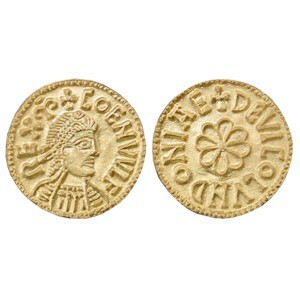 Unique as the only purpose made Anglo-Saxon gold penny of clearly regal design. Unique as the only gold coin with a London mint signature to be struck between the gold shillings of c. AD 630 and Henry III's gold penny of 20 pence of 1257. Unique as the only English coin of any type to refer to the important extra-mural commercial settlement of Lundenwic. The Coenwulf gold penny / mancus is the most stunning and attractive of all Anglo-Saxon coins and is an icon of Anglo-Saxon coinage.